Sometimes fresh, clean water is all it takes to make a bird's day. Makes our day, too. Water will actually attract more species of birds than feeders will. Birds such as wrens, catbirds, and bluebirds, who eat insects or fruit, don't visit most feeders. But a birdbath attracts all kinds of birds. 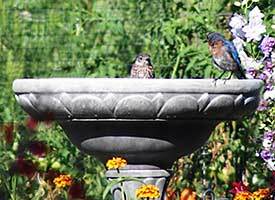 Put your birdbath in your garden, and the birds will find it quickly. Birds will bring their babies to the bath and show them where it is. Like the baby robin getting its first bath at the Four Seasons Bath, below. A birdbath brings great happiness to a home. It's one of the easiest ways to bring birds up close, where the whole family can get a really good look and enjoy their beauty. No deeper than three inches at the center. It should be even shallower at the edge. Many birdbaths are way too deep for birds to feel secure. Birds don't like a glazed, slippery bottom. Cement is good, but it's heavy and hard to handle. Some of the new fiber-and-resin baths are amazingly lightweight, and they have a rougher texture, that makes birds feel secure. The plink or splash of moving water is pure invitation to birds. 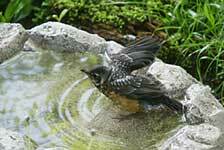 It dramatically increases the number of species that visit a birdbath. An easy, inexpensive way to keep the water in motion is with a Water Wiggler. It comes in battery-powered and a solar versions. You add it to any birdbath. We have one of these at the Birdwatching Dot Com garden, and we love to watch the birds come visit it. See a full picture of the bath with more details in the sidebar at right. It's easy to see from the house, easy to clean, and somewhat safer from predators. Place the birdbath where you can see it from indoors. Maybe from your dining room or kitchen. Or locate it in your garden. Nothing is more decorative. The bluebird above was photographed at the Kozy Spa at Birdwatching Dot Com. This is a pretty bath that you can set on a table or on the ground. Made of hand-painted glass.